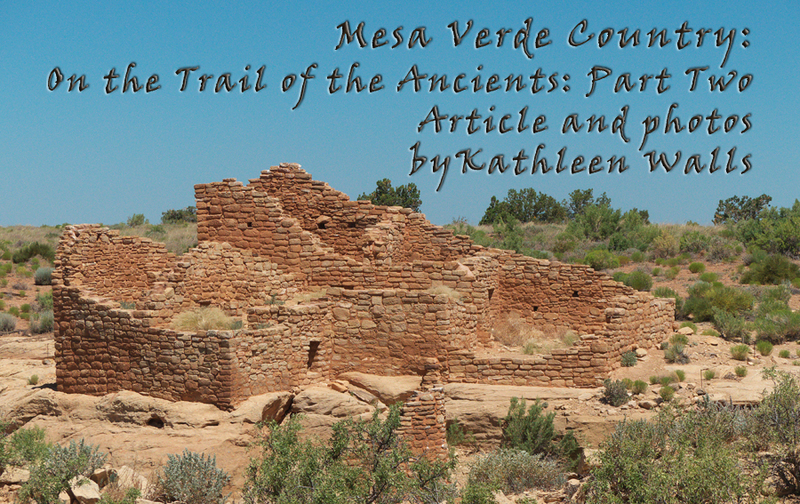 Ancestral Puebloans didn't limit themselves to Mesa Verde National Park. They built dwellings throughout the four corners area. We were trying to see allof the most interesting ones so we headed for Canyon of the Ancients National Monument. It was created to protect these sites. Our guide, Jim Colleran told us to "look for sage and prickly pear cactuses growing on rubble mounds" to recognize unexcavated sites. We drove to Castle Rock in the Sand Canyon area of Canyon of the Ancients. 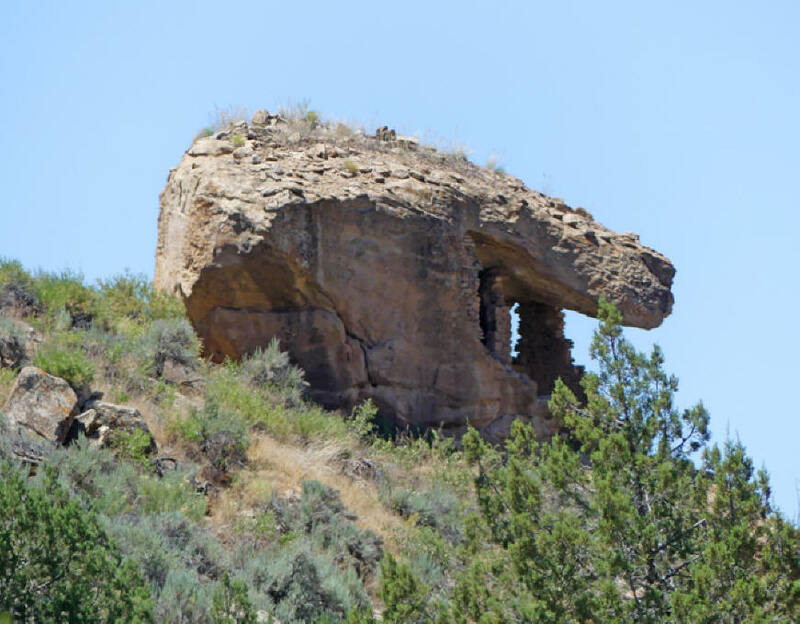 Castle Rock was once called Battle Rock but in the 1800s, the names were switched by a survey team. Now Battle Rock is the one to the southwest. There's a flat place on top of the rock formation. This was where a group of Ancestral Puebloans build their city in the latter part of the 1200s. An ancient legend and anthropological evidence indicate these people were being harassed by a group of nomadic tribes, probably ancestors of modern Utes. These invaders may have originally come to hunt or trade with the local people, liked what they saw and permanently moved here. I couldn't resist making my way partway up the slope to examine the site closer. Naturally, in spite of advice from our guide, Jim, I wore my usual earth-shoes sandals instead of those sensible but so confining tennis shoes. I made it pretty easily. Once Jim told us the boulders in front were once part of a wall built around 1250 as a territorial marker and for defense, it was obvious where they have been shimmed to fit in place. In spite of the high place and walls, invaders must have breached the site and defeated the locals, killing many of them. 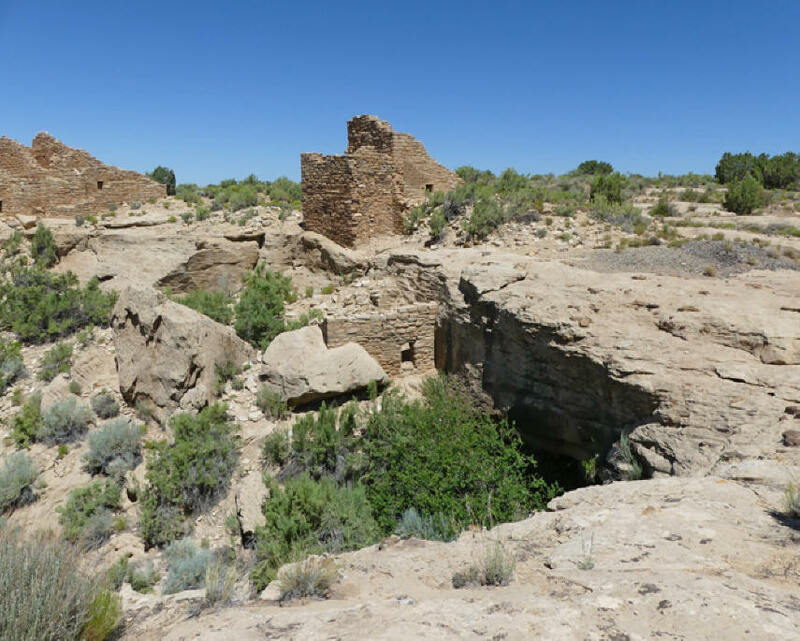 Anthropologists found many skeletons left in the kivas. Wounds and the placement of bodies indicated a battle after which the Ancestral Puebloans left. Respect the ruins. This is the trailhead for a nice hike with plenty of ruins. Remember if you visit, do not disturb any sites or take any artifacts. About a half-mile before we reached the Utah border there's something worth pulling over for, a big rock formation almost on the highway. 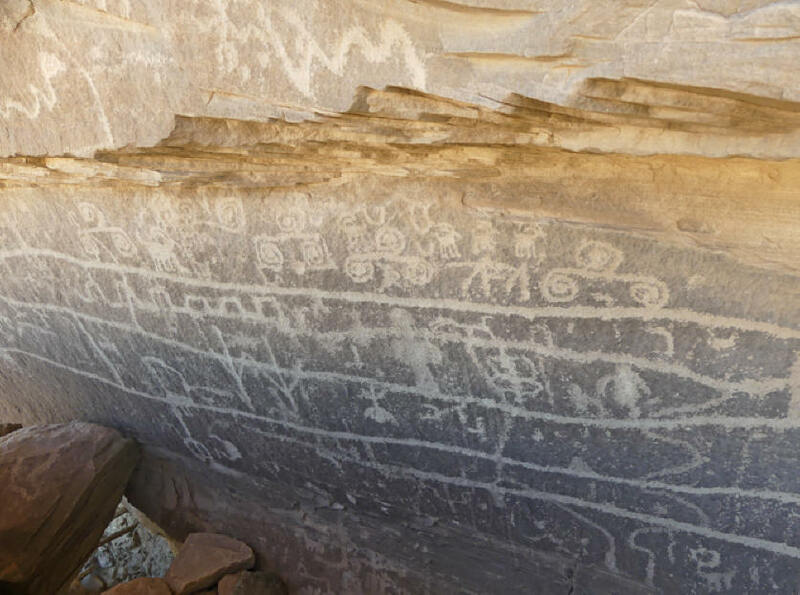 On the inner side of the rock, there are ancient petroglyphs made by the Ancestral Puebloans. Some modern graffiti was scribbled on the rock at some places also. Jim points out Kokopelli, a humpbacked flute player who was the god of fertility. Our next stop was a quarter mile down the road. We took the road to the right. The pavement ended but the dirt road was drivable. Our fearless driver, Christy, took us into Yellow Jacket Canyon. 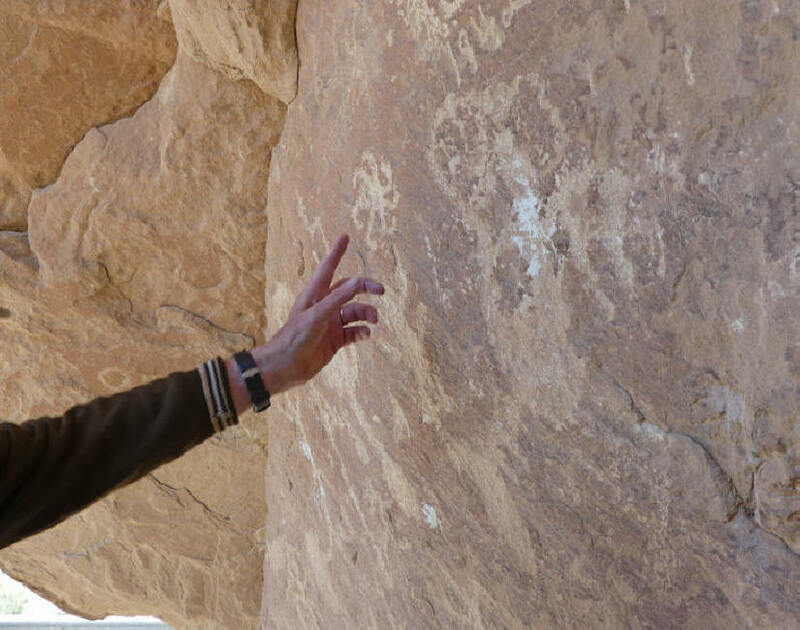 And Jim showed us a rock filled with petroglyphs. This one was more of a challenge for the sandals but I still clamored up the rocks and was rewarded with a great view of the petroglyphs. This one much more pristine. Since these petroglyph are harder to access so completely pristine. We passed in front of the old Ismay Trading Post. It's closed down now but was a local hotspot since 1921 when it was opened by John and Eleanor Heffernen Ismay. 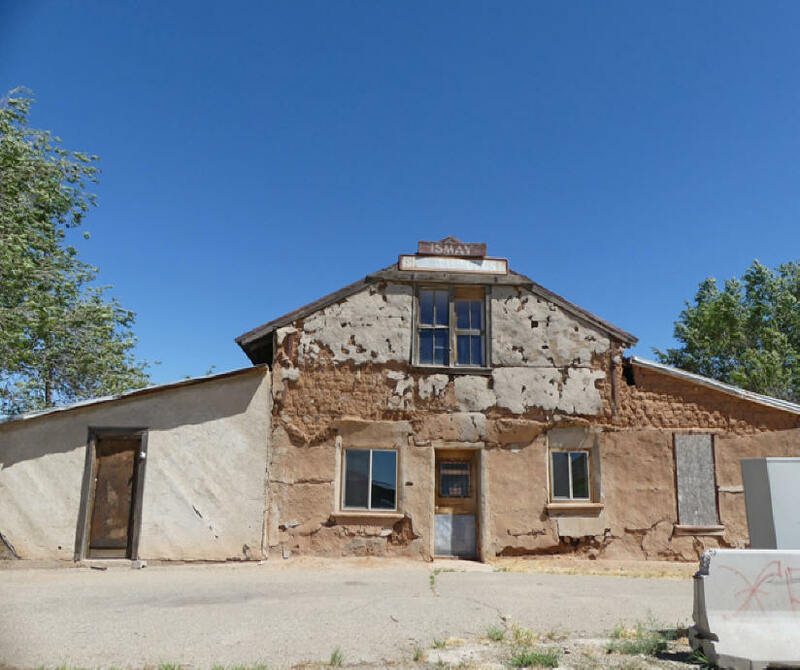 Not too long ago the road into Cortez was so difficult that workers would shop here instead. There's a huge bin of glass bottles in front. It was filled by workers who would stop, buy a six-pack, pop open a bottle, finish, and toss it on the heap before driving home. Wildlife is common in this area. 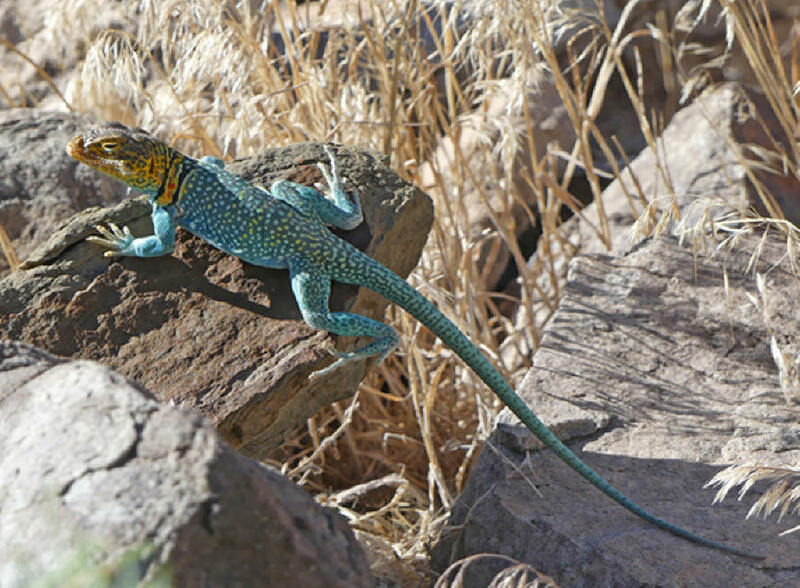 Look for mule deer and a colorful little lizard called eastern collared lizard. The one I saw was scrambling among the rocks in midday. Deer are more common at sunset or early morning. I saw one grazing the evening before. 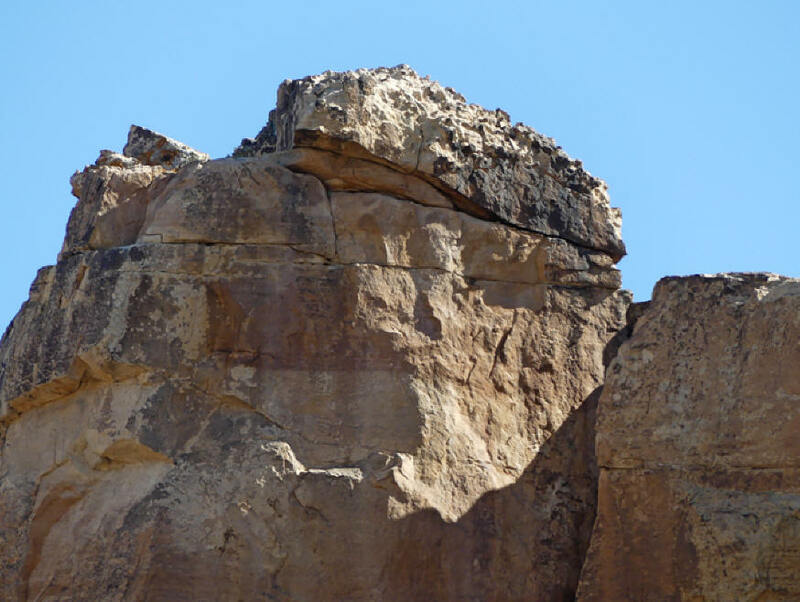 The cliff swallows make nests on the overhang of exposed rock. This is the trailhead for a nice hike with plenty of ruins. 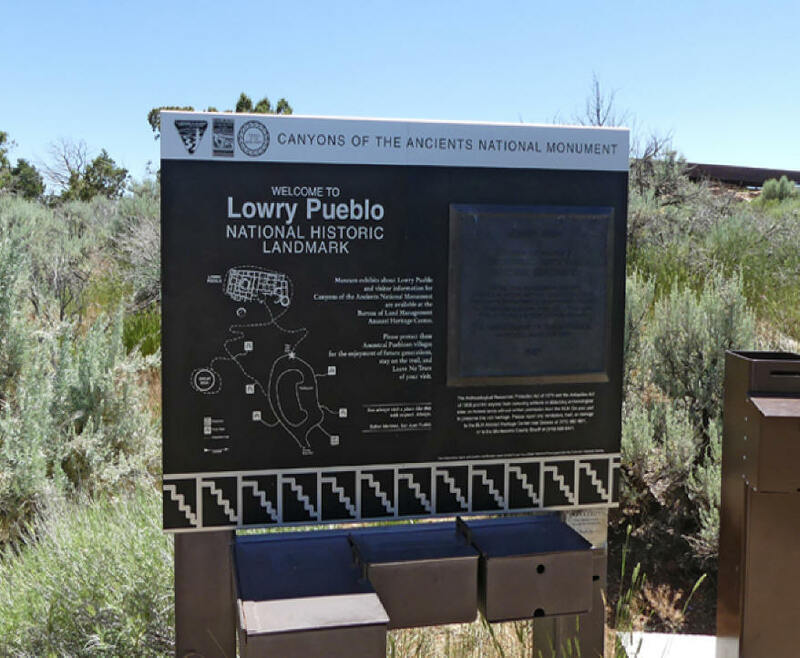 Perhaps the most famous site in Canyon of the Ancients is Lowry Pueblo, noted for its Great House and Great Kiva. 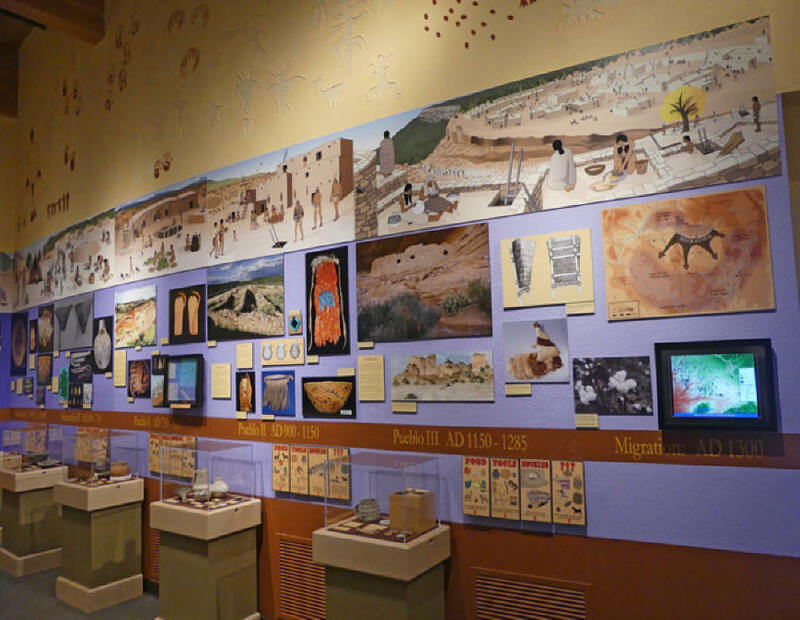 Lowry Pueblo is unique in several ways. It was built on top of an earlier pit house settlement and shows strong Chaco Canyon, New Mexico influences in the construction. It was a large community scattered around the site I probably was home to as many as 100 people. 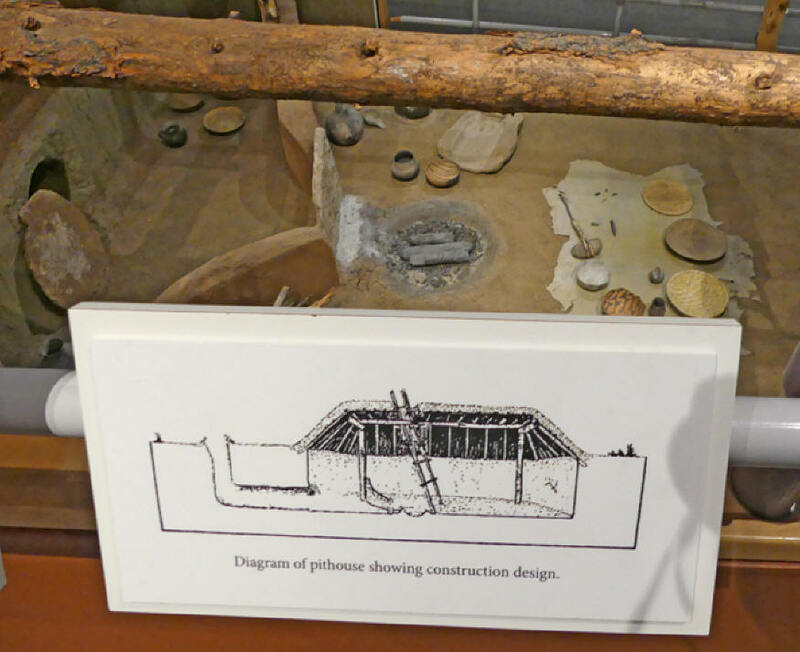 The Great House was multi leveled and well laid out with about 40 rooms and several kivas. The rooms are larger than most of the other sites you have visited. There are decorative items such as small chinked in stones that is typical of the Chaco Canyon pueblos. 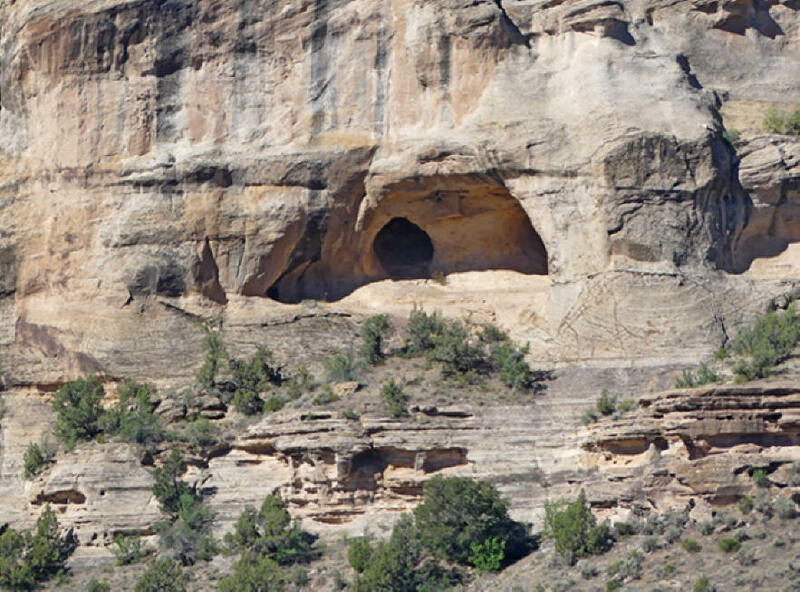 We descended into one of these original kivas though a narrow passageway. It is preserved much as it would have been originally. When we entered it felt as if we had stepped back in time. In this kiva, you can observe the upper walls which has shelves built in probably to hold ceremonial items. So much more of a reality feeling here. We walked over to view Great Kiva. 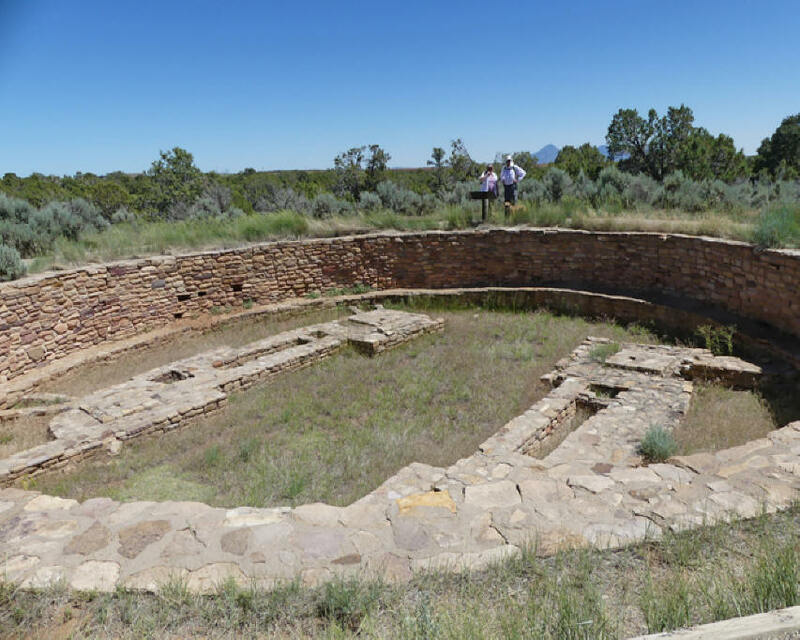 It is far larger than most kivas and probably used for community events. The stonework pieces in the center are believed to represent the summer people and the winter people. Each group was in charge of the rituals during their season. All around the site there are walls and smaller pueblo ruins and it's not unusual to see bits of pottery on the ground. Remember not to remove any. There are restrooms and a picnic area. 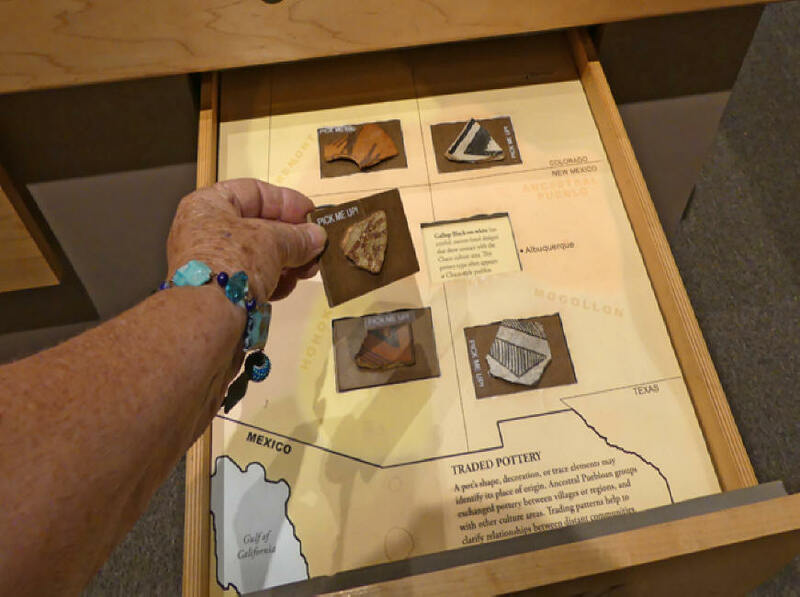 Anasazi Heritage Museum is 10 miles north of Cortez is the visitor's center for Canyon of the Ancients You'll find over 3,000,000 artifacts that were excavated in the area. There is a theater and a library and is as much for scholars as casual tourists. 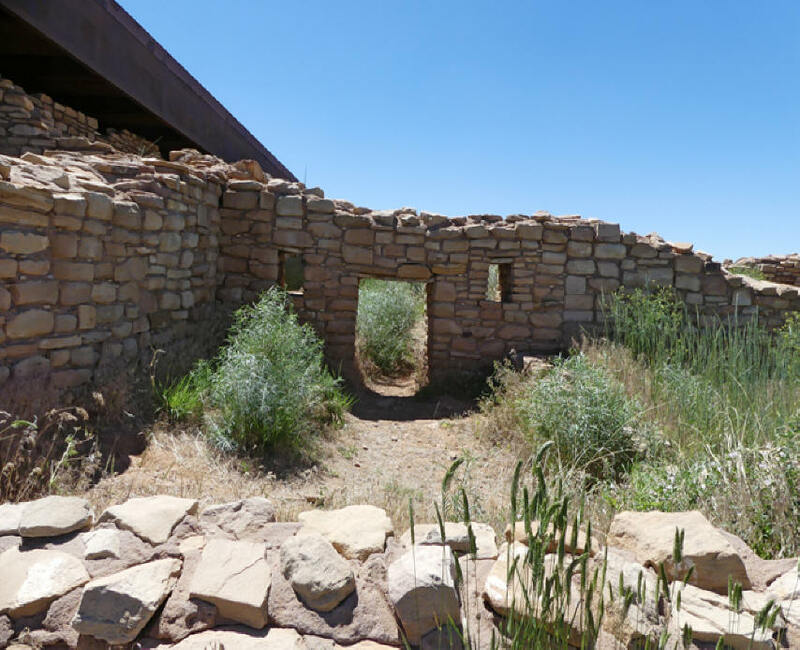 To the rear there is a one-mile trail that leads to Escalante Pueblo. 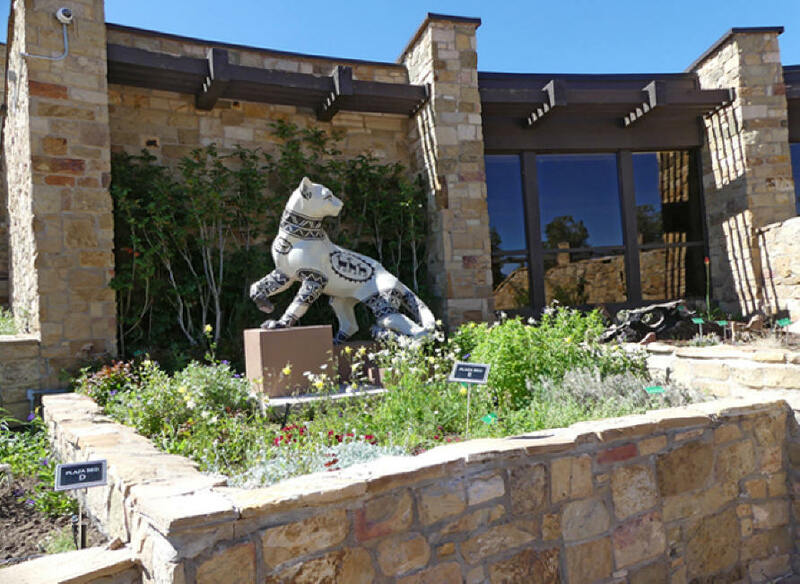 A black and white life sized puma stands guard in one of the Center's garden beds. It's one of 17 public art projects of the San Juan Mountains Association called Pumas on Parade. This guy's name is Chuska Puma and his black and white pattern is reminiscent of Ancestral Puebloans' pottery. 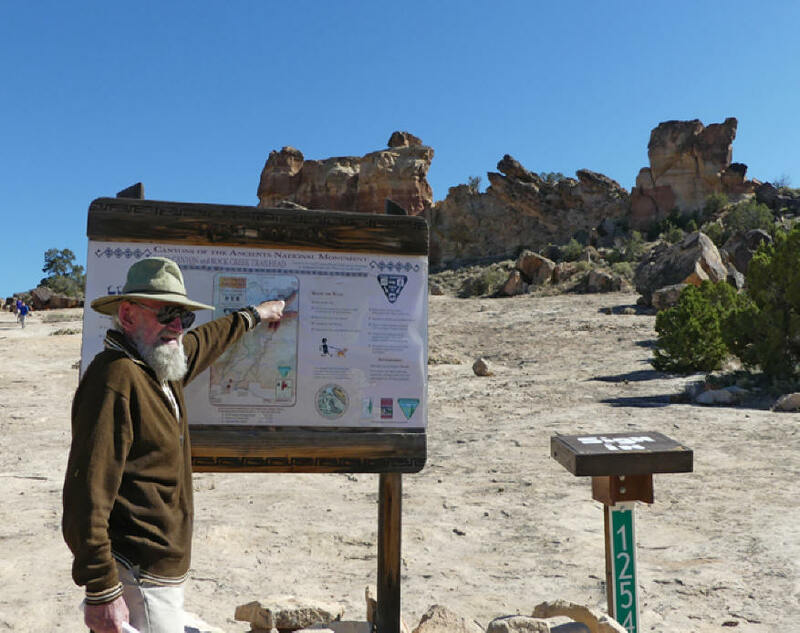 If you get to the visitor's center in Cortez, you'll see another one named Sky Prowler. It's sky blue and covered with clouds, stars and rainbows. This museum tied it all together for me. The ruins tell the story of greatest transition humankind made in this country. From the earliest pit house, when people moved from hunting and gathering to agriculture and for the first time gathering in villages. The timeline running on the wall helps put the ruins into prospective. Think of it as tecnological advances because this was the high tech of the day. Normally cooking was a tedious process of dropped hot stones from a firepit into the food set in waterproof baskets to cook. 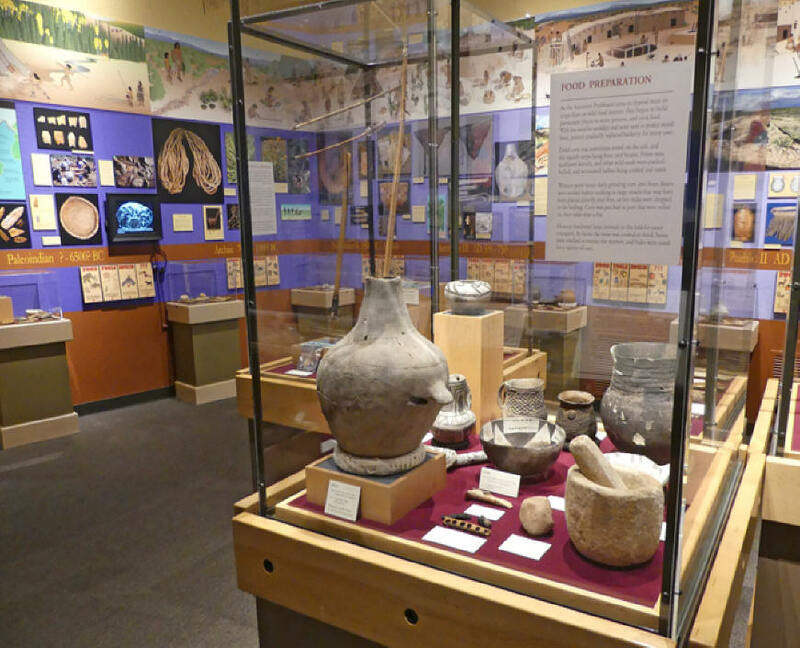 One exhibit shows the pottery these people invented. 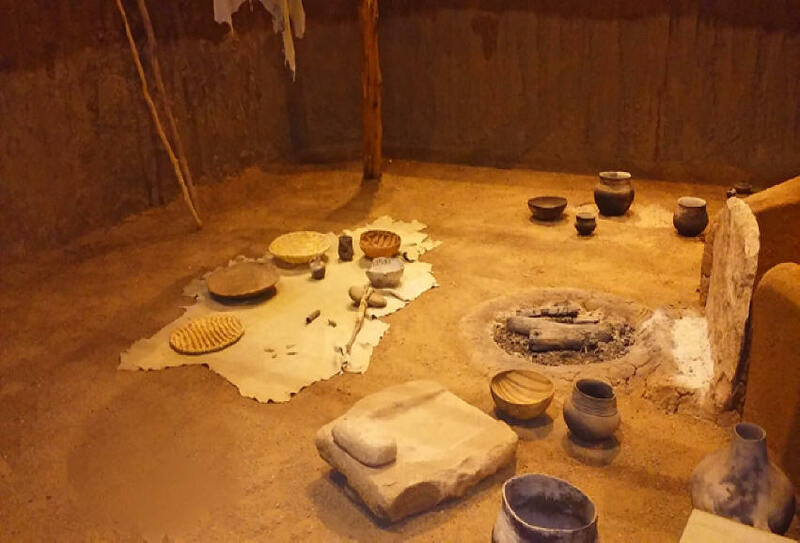 Pottery, especially fireproof pieces, was a huge technological advance. Now they could cook beans in pottery directly over a fire. Bean cooking would have been impossible with the dropping the hot stone in baskets method. This led to another advance in weaponry. Their arsenal advanced from the old atlatl, a spear thrower that increased leverage making it a more powerful weapon than just a simple spear, to the bow and arrow. Since they now were able to get some of their protein from beans they could survive on hunting smaller animals such as rabbits and deer. Exhibits in the Center trace all of this. 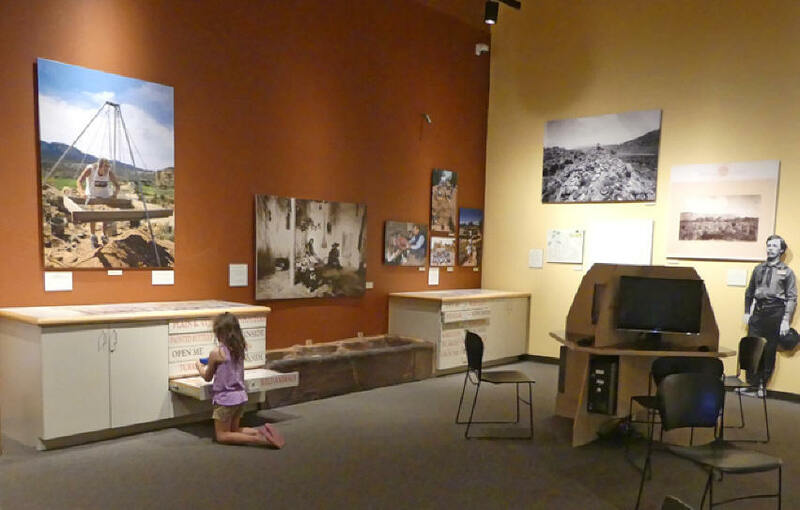 Incidentally if youplan to visit with children, they're not likely to become bored The center has many interactive exhibits that appeal to children. My favorite exhibits relate to the pit house. These multilevel exhibits let you view from above then walk to the lower level and get a different prospective. The upper lever has a detailed diagram showing construction details. From the lower level, you see many of the items used in the day to day lives of these people. I was able to understand the firepit and ventilation system seeing it here rathere than when I sar parts in actual ruins. 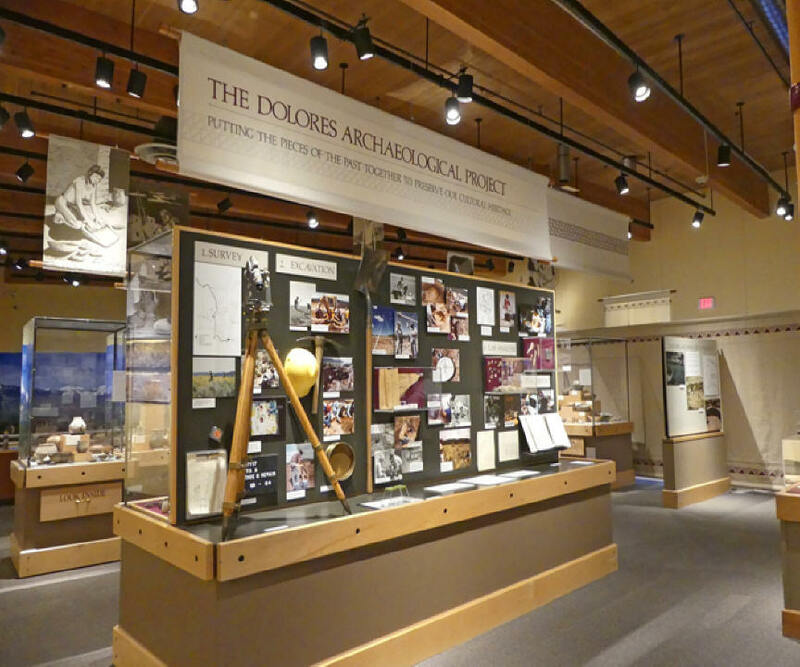 Much of the artifacts in the Center came from the Dolores Archaeological Program. That program came about between 1978 and1986, when it was decide to build a dam nearby. Before the McPhee Dam Reservoir could be built scientist wanted to preserve any relics in what would become the Reservoir's bottom. 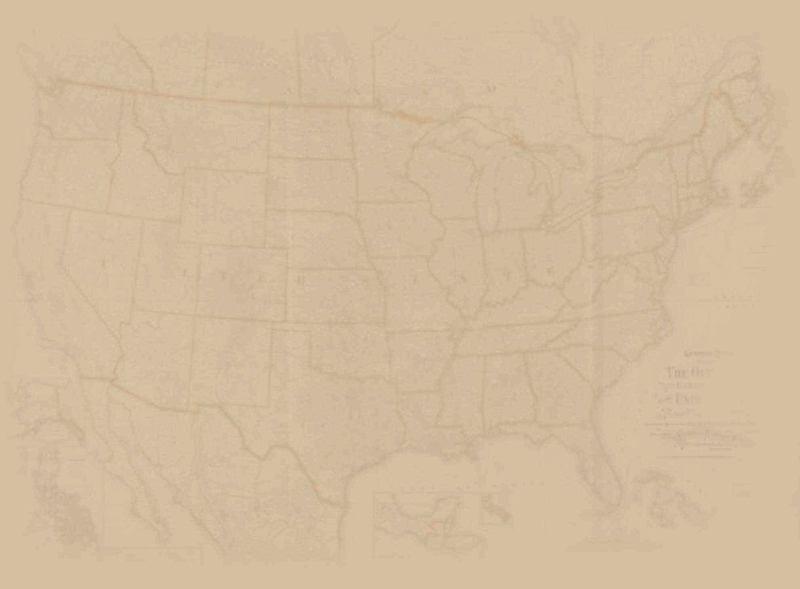 This was the largest public archaeology project ever undertaken in the United States. 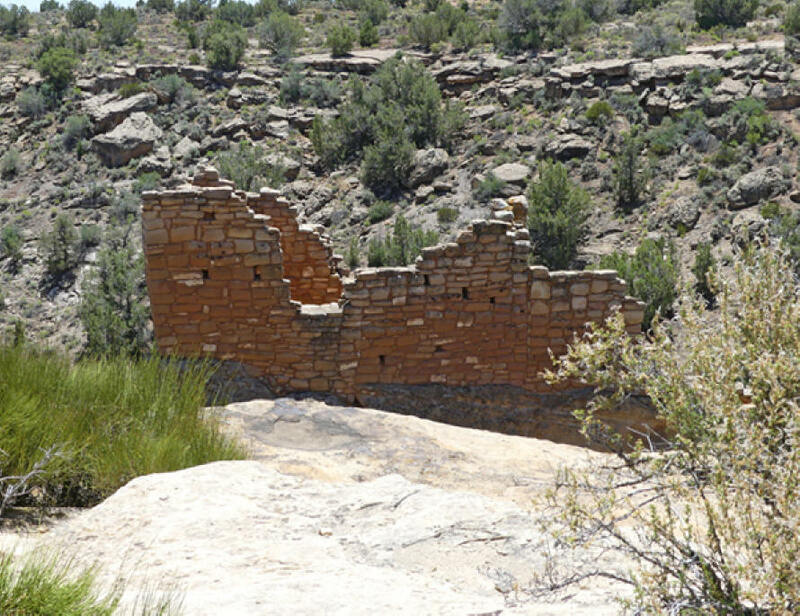 The excavation discovered 1600 prehistoric households and villages in the Dolores River Valley. One exhibit tells a little of this project. Another exhibit relates to the huge trading base these people had. It ranged as far away as Mexico and Central America. Pottery was a big trading item as they made very beautiful pieces. 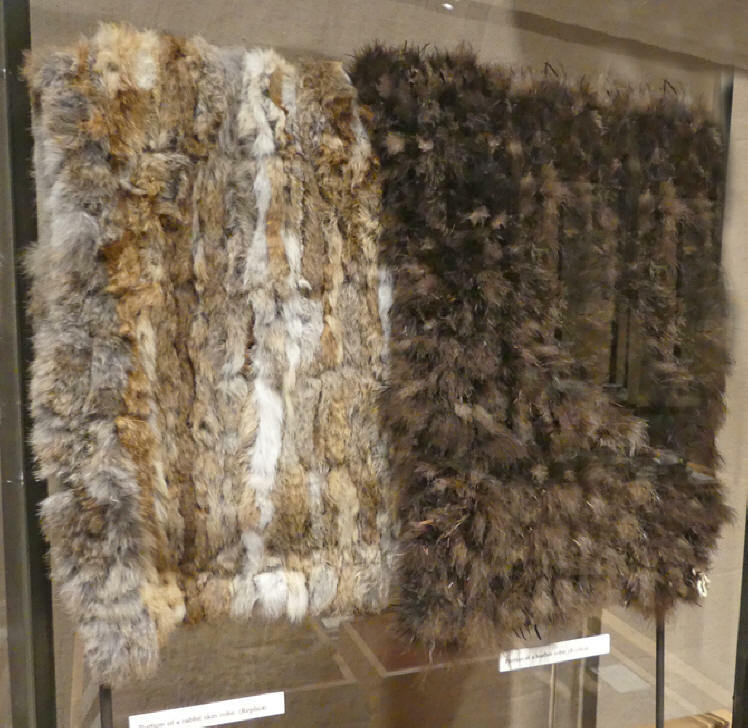 Another exhibit that helped me visualizes their lifestyle was replicas of rabbit skin and a turkey feather blankets. Although they kept turkeys and dogs, there is no evidence either were eaten. Turkeys would have eaten garden pests and their feathers were used for robes and blankets. There wer two tyopes of dogs found one large and another smaller black and white breed. I have no idea how anthropologists knew the dogs were black and white but they seem to know that. Dogs were pets and probably watchdogs. McPhee Dam Reservoir, the original repository from which so many of the Center's artifacts came, is just 10 minute drive north of the center just behind Escalante Pueblo. 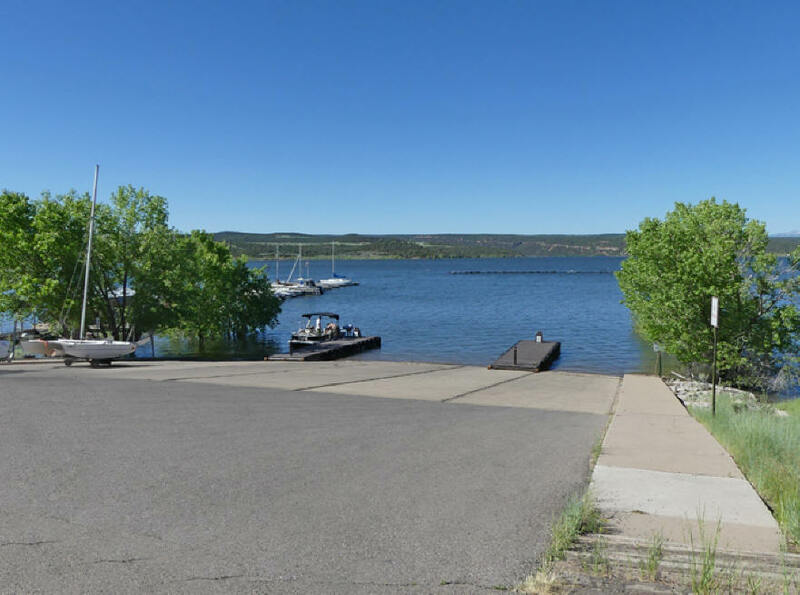 It offers boating, water skiing, fishing, hiking and a campground. 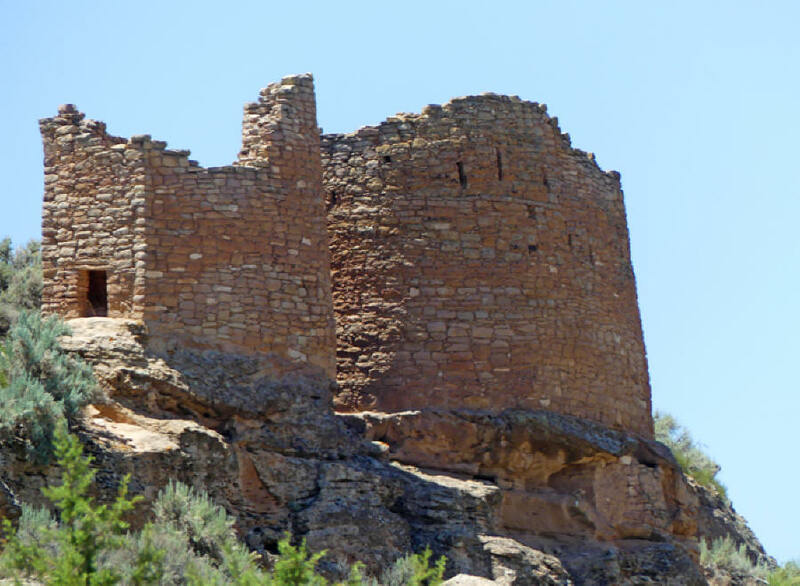 I had never heard of Hovenweep National Monument before this trip but it is another must see. It's just across the Utah border in Navajo Territory. One of its most spectacular ruins, Cajon Ruins in the heart of Navajo Country, is a bit off the beaten trail but trust me. Go find it. One of the pueblos perches on the edge of a cliff. On the rear wall, you'll see several oddly placed small holes. These holes admitted shafts of sunlight that marked a specific spot on the interior wall at summer solstice. These people farmed under the harshest conditions, they needed to plant before the summer solstice to take advantage of seasonal monsoons. That they tracked the dates, suggests a solar calendar. One nice thing here is there are no rangers to hurry you along. You can wander around to your heart's content. Are these solar data recorders? 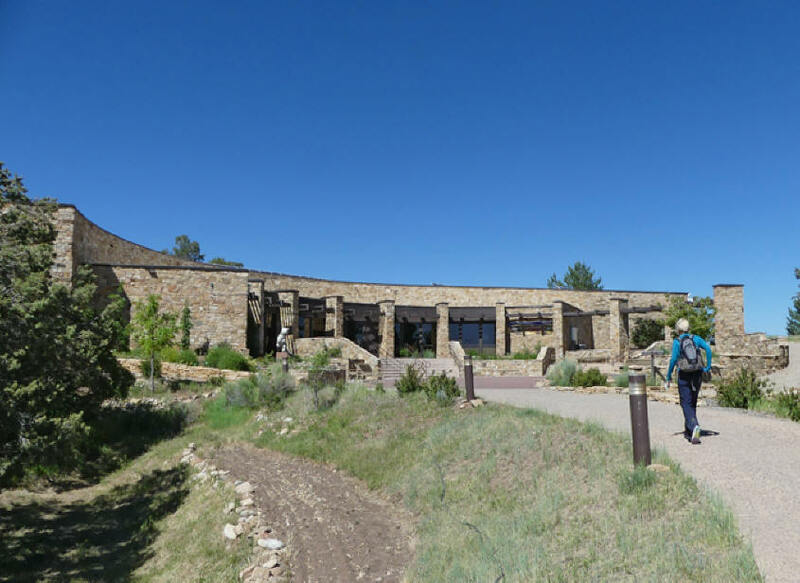 Hovenweep Visitor's Center, several miles away, has shelters with tables out front. 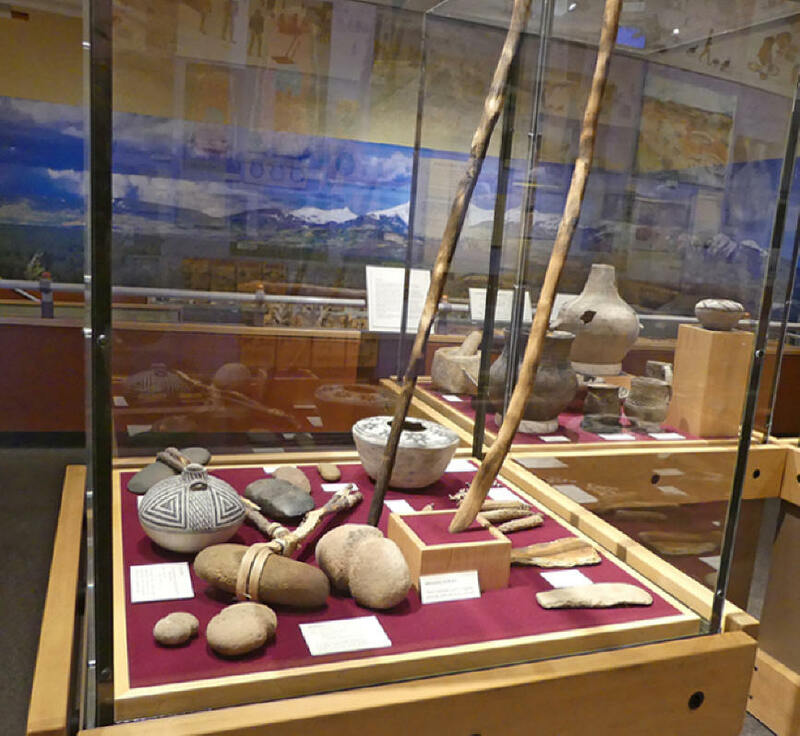 Inside there are exhibits of Ancestral Puebloans artifacts. There is an interpretive film and rangers conduct programs on a regular basis. 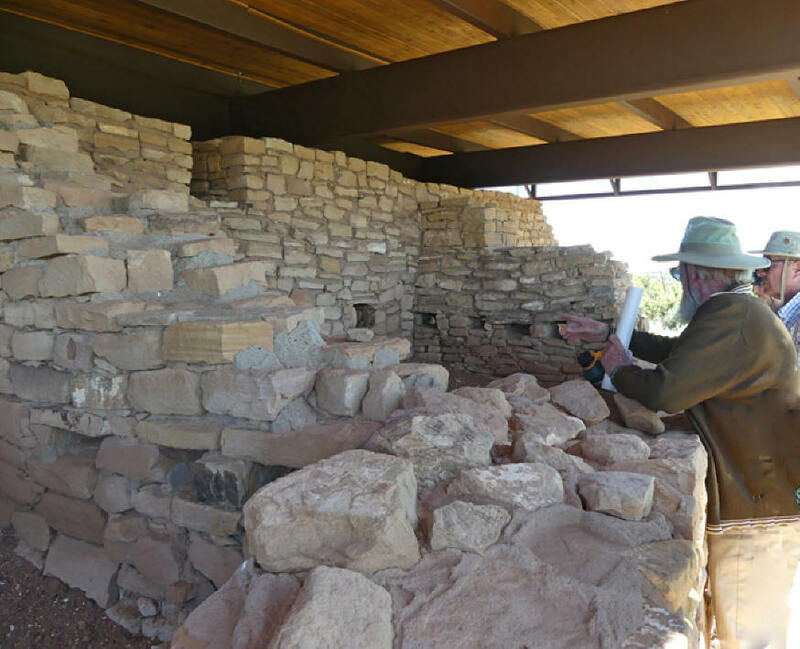 We headed part way down the two mile hiking trail from the visitor's center to the Square Tower Group which is the largest collection of Ancestral Puebloan structures at Hovenweep. It was named for the four-story tower sitting at the head of the canyon. Stronghold House was the first structure that caught my eye. It's is named for its fortress like appearance rather than any known purpose. Jim suggested a short 15 minute hike to the canyon bottom to get a better view. Let me just say, I probably should have listened and worn those hated tennis shoes. Remember this if you visit. From the bottom we did have a completely different prospective. Twin Towers is a unique pair of structures. One tower is oval, the other horseshoe shaped. They almost touch one another. 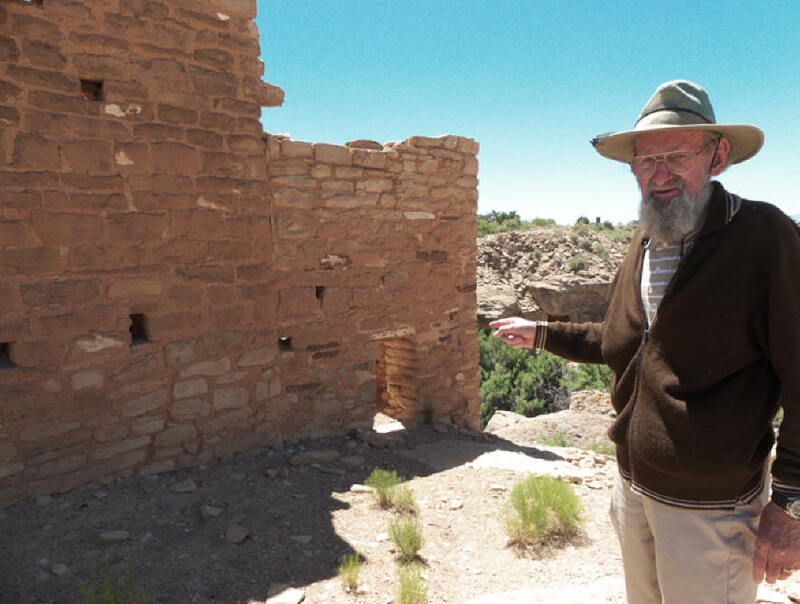 Once they had sixteen rooms and are considered one of the best constructed ruins in the Southwest. Another eye catcher is Eroded Boulder House. The boulder forms the roof and part of the walls of the structure. In just a few days visit, we had traversed several centuries and I came back with a more profound understanding of the human trail from pre-history to modern civilization. This is a trip I would advise for all. Just remember there are some places that are difficult for babies or persons with physical handicaps.